Speaking at the conference, Deputy Prime Minister and Foreign Minister of Georgia Mikheil Janelidze said that joining the Southern Gas Corridor would allow Turkmenistan to transport its gas to Turkey and Europe. M.Janelidze also touched upon the TAPI project - a gas pipeline being built between Turkmenistan, Afghanistan, Pakistan and India. In the context of energy transfer from the region to Europe, the politician stressed the particular importance of such projects as the South Caucasus Gas Pipeline, the Transanatolian Gas Pipeline, the Trans Adriatic Gas Pipeline and also "White Stream". Expressing gratitude to the Government of Turkmenistan and personally to the President of Turkmenistan, Gurbanguly Berdimuhamedov, for the support provided for convening of the 28th Meeting of the Energy Charter Conference and commending the efforts in enhancing the role of the International Energy Charter throughout the year of the Chairmanship of Turkmenistan. 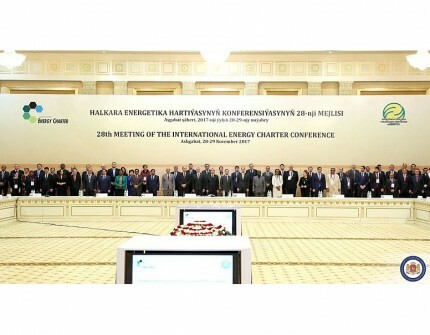 The Ashgabat Energy Charter Declaration, as a strategic mid-term document towards the next review to be undertaken in 2019, in accordance with Article 34(7) of the Energy Charter Treaty. We recognize that as countries modernize and transition their energy systems according to their national circumstances, needs and priorities, aligned with international commitments to mitigate climate change and achieve Sustainable Development Goals, the Energy Charter Process contributes to enabling the large flow of investment needed and improving business environment. We acknowledge that promoting quality infrastructure investments is essential for bridging the existing energy infrastructure gap in the world. We welcome the preparatory work of the Energy Charter Secretariat and acknowledge its continued efforts to develop a new publicly available flagship publication, the Energy Investment Risk Assessment, which will assist interested countries in minimizing investment-related regulatory risks, thereby enabling an optimization of investment flows. We underline the importance of industry’s involvement in the Energy Charter Process and welcome the recent activities of the Energy Charter Industry Advisory Panel. We acknowledge continued efforts by the Energy Charter Secretariat on dispute prevention and the possibility of amicable dispute resolution, mediation and legal training. We encourage the State signatories of the European Energy Charter or the International Energy Charter to accede to the Energy Charter Treaty and stand ready to assist respective countries in this process. We acknowledge the work of the Energy Charter Secretariat in facilitating the accession process that countries choosing to accede to the Treaty are required to undertake. We recognize the role of the Energy Charter Process in enhancing regional and international energy cooperation, facilitating interconnectivity and promoting open and competitive energy markets in order to ensure universal access to sustainable energy sources, except for circumstances generating concerns for international security and national security of the involved states, thus reinforcing energy security. We acknowledge that natural gas can play an important and effective role in moving towards a low greenhouse-gas (GHG) emission energy future and we believe that a well-functioning, transparent and competitive global gas market including LNG trading hubs should be further developed. We welcome the work on energy transit under the Chairmanship of Turkmenistan and will continue our work on transit issues with a view to supporting diversified energy sources and supply routes and secure reliable and sustainable energy transportation. We continue efforts to make further progress in the modernization of the Energy Charter Process as appropriate in order to meet our common objectives and with a focus on the Energy Charter Treaty’s core business. Contracting Parties to the Energy Charter Treaty will seek to launch a dialogue with the aim of exploring the potential update and modernization of the Energy Charter Treaty. We encourage the work of the Energy Charter Secretariat in promoting and integrating regional energy markets for long-term energy sustainability and building energy resilience, and note the relevance of these regional activities to facilitation and promotion of strategic infrastructure projects aimed on delivering secure, sustainable and competitive energy to customers.